One of a kind necklace. 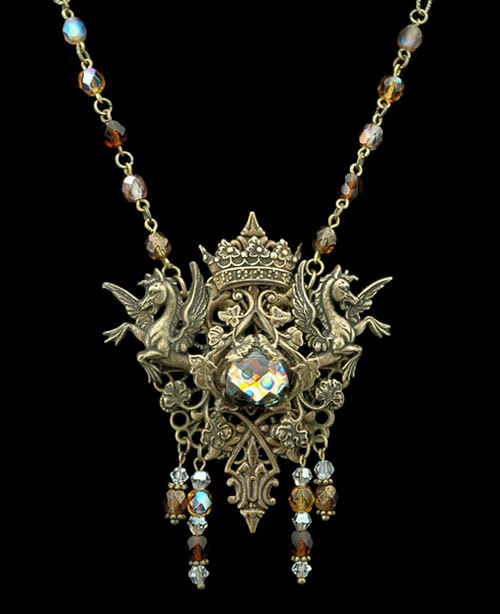 Two antiqued brass winged horses adorn an unusual, rare Peacock Crystal held in place by delicate morning glories, leaves and filigree. Finished with an antiqued brass crown on top, and delicate Austrian crystals in AB shades of metalized gold and amber tones which dangle from the bottom. The pendant is suspended from a 16" etched brass chain with matching Austrian crystals. The pendant is 2-1/2" wide by 3" in length.